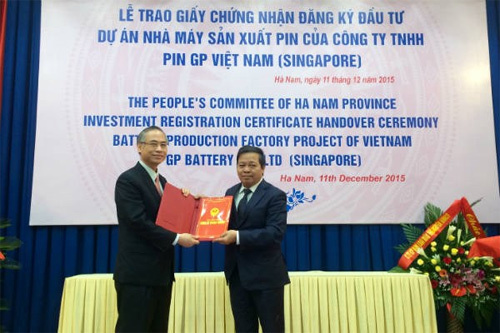 The People’s Committee of northern Ha Nam province granted an investment license for a 6-million-USD battery production project by Vietnam PG Batteries Ltd., Co. on December 11. PG Batteries Vietnam, a venture between Singapore’s GP Batteries International Limited and Vietnam’s Hanoi Battery Joint Stock Company, will construct a 29,400sq.m factory at the Hoa Mac Industrial Park in Duy Tien district from now to 2018. 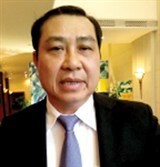 Secretary of the provincial Party Committee Mai Tien Dung said that the province vows to ensure sufficient power and water supply alongside security and transparent customs procedures for the project. The project will also be provided with a waste water treatment system, land for workers’ residential area and qualified human resources, he added. Henry Leung, Director-General of GP Batteries International Limited expressed his hope that local authority will provide the company with preferential policies and pledged to keep the project’s progress on schedule./.